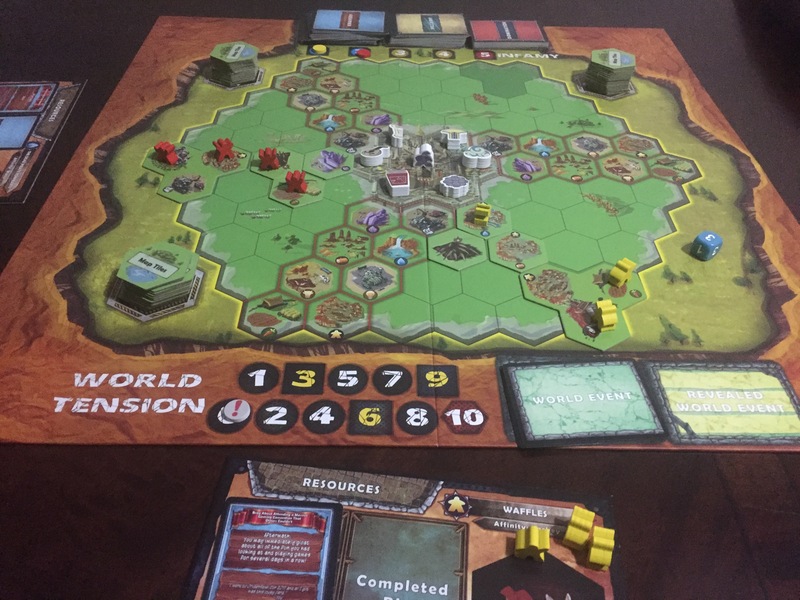 Overlords of Infamy is a 1 – 5 player worker placement game, designed by David Zuckman and Christian Olsen, published by Obscure Reference Games. Why aren’t there more games that let you play as the Bad Guy? 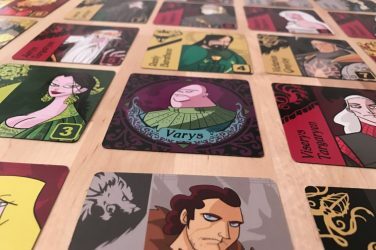 A few games let one player play the Bad Guy while others play the good guys, like in Fury of Dracula or any of the Star Wars games. 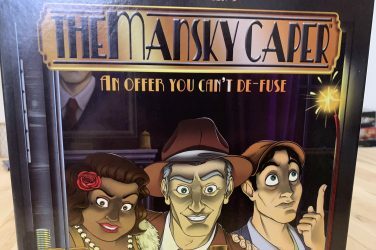 What I’m talking about, though, is a game where EVERY player must twirl their moustaches, raise their eyebrows menacingly, torture the hero, and out-Bond villain everyone else to achieve victory. Overlords of Infamy proposes to fill that shameful void in our gaming lives. Every player commands an Evil overlord who seeks to “Play an Awful Pop Tune 24/7,” “Fill Pinatas with Ornery Bees,” or accomplish other acts of high villainy in their quest to score victory points. 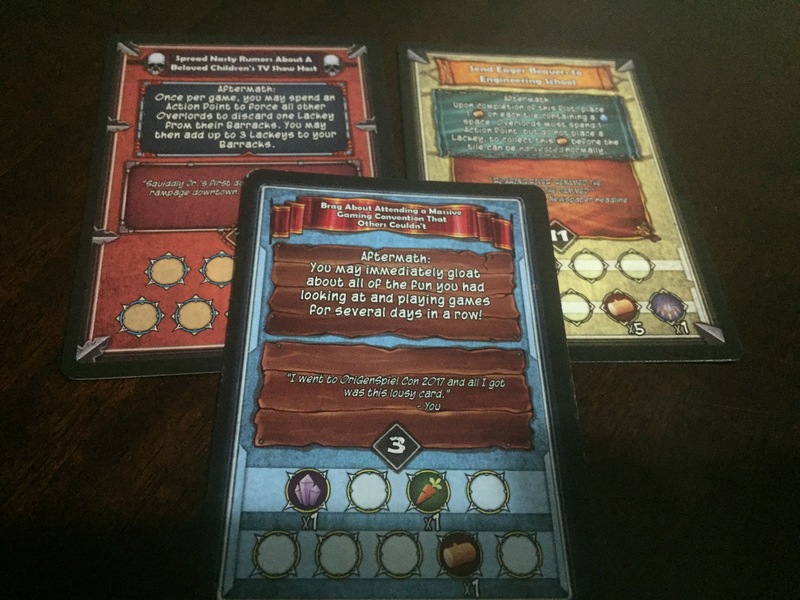 Mechanically, Overlords promises an experience akin to Lords of Waterdeep or Settlers of Catan. Lords of Waterdeep with some tongue-in-cheek humor? I hope it’s good! Every player starts with a lair, represented by a three-hex tile in their corner of the board. The lair has a barracks for your evil lackeys, and also gets you started towards gathering resources. You spend most of your turns either revealing and laying resource tiles, or moving your lackeys to pillage said resources. Whatever water, wood, cows, or other resources you gather then serve to fuel your nefarious plans. 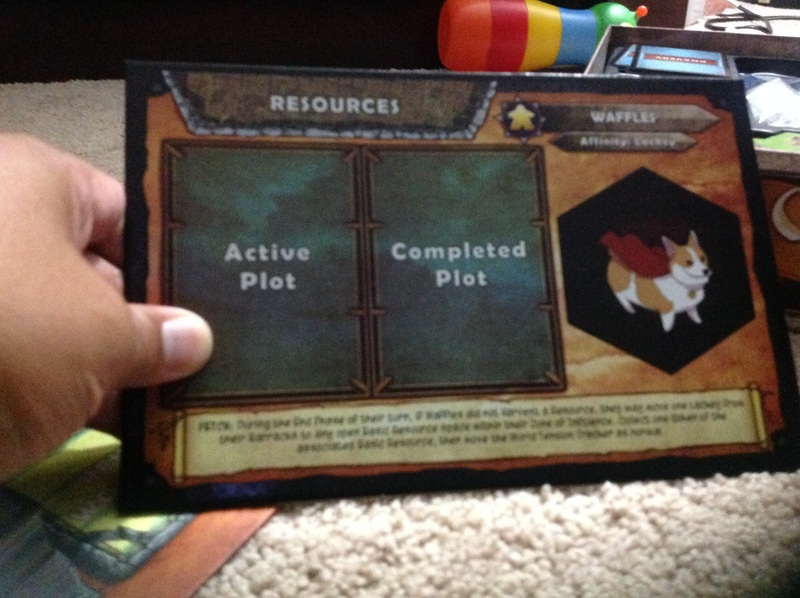 In Lords of Waterdeep, the quests were named stuff like “Clear Out Witches Coven,” or something like that. Here, you “Organize the Event of the Century, but Make Parking Impossible.” As you accomplish small acts of villainy, you will rise along an infamy track which will allow you to take on greater, more destructive acts, like “Make Earthquake Machine” (yeah, buddy!!!). 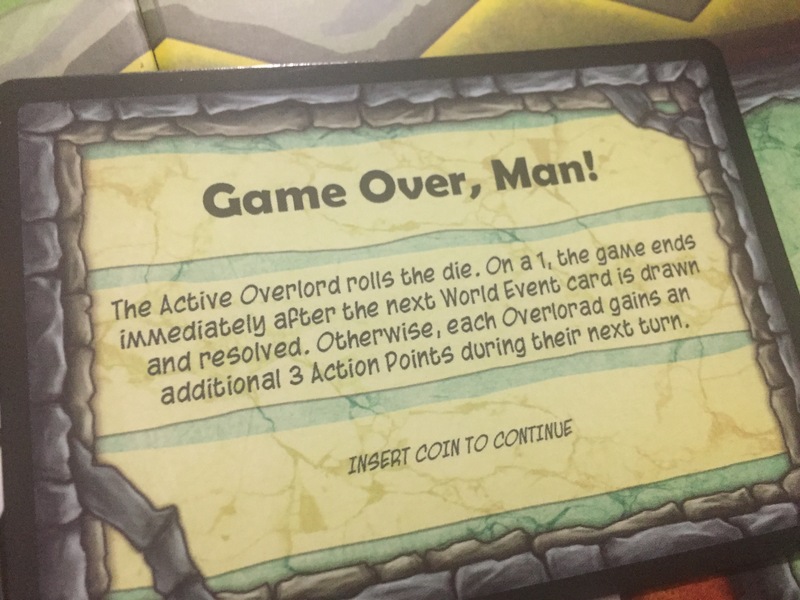 The overlord who earns the most points via completed quests wins the game. Unlike LoW, each Overlord has unique player powers rather than scoring conditions. I found that the various player powers had minor yet frequent effects on strategy, usually helping gather and/ or manipulate resources. Also unlike LoW, Overlords invites more significant player interaction. Players can use espionage actions to peep at other people’s quest cards, chop at their resources, and eventually assassinate their lackeys. Much of the humor of the game comes from the quest cards, but it also comes from World Events that strike whenever too many nefarious deeds pile up. The world event cards change the game in various ways – they can either benefit or harm players, provide a catch-up mechanism for players lagging behind, or even prematurely end the game! More on that one later. Finally, what game about Evil Overlord villainy would be complete without an Adventuring Hero to screw everything up? At basic player counts for this game (2 – 4), players take turns moving the Hero around so that he hinders the efforts of their Overlord opponents. The Hero has a home base at the center of the board called the Kingdom of Good. If an Overlord so chose, they could raid Hero’s larders for basic resources, but also for relics which will help Overlords complete the most dastardly quests. 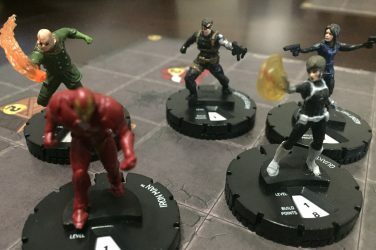 At five players, someone can actually play the hero! The hero player has their own set of quest cards which, when completed, will affect the overlords in some way. In solo mode, the adventurer follows a simple priority system which animates his movement. The player’s goal in solo is to earn a set amount of points before the Hero completes three hero cards. As I said in the introduction, I feel that the larger world of board games under-represents the genre of cartoony overlord. You can find that in smaller card games, but not so much in bigger, light-medium weight games like this one. I admit to this game making me smile before I even opened the box, just at the thought of the theme. The humor in the game is… well, it’s there. I think the writers went for volume as opposed to finely tuned bits of humor, so I’m betting they know how stupid some of the jokes are. However, I listed it here in my likes because I did find some cards that made me laugh. “Reverse the Rotation of the Earth” is a clear Superman 4 reference which drew a guffaw, and “Replace Real Journalism with Clickbait Lists” hit very close to home in our current era of “fake news”. In terms of gameplay, I found it to be really solid. It definitely put me in the same worker placement headspace that Lords of Waterdeep did. In both games, the key to winning isn’t just in completing quests. 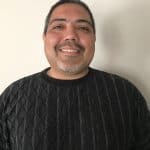 Rather, good play involves gathering resources and completing quests in ways that put you in position to complete further quests more efficiently. This game replicates that strategic level of thinking very faithfully, while putting its own spin on it. 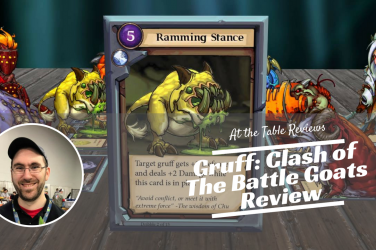 Rather than getting that leg up from action spaces and completed quests like in LoW, a good player in Overlords leverages their player powers as well as acts of violence against other players and the adventuring hero. All of that provided a lot of grist for the mental mill, yet in a way that didn’t inspire too much AP. You might have a couple of options to gather resources, but the quests are simple enough to complete and provide good direction as to what needs to be done. Finally, you can play a dog. I give any game with a playable dog the benefit of the doubt. Notice that I compared Overlords to Lords of Waterdeep quite frequently, yet did not mention Catan. I don’t know why Overlords claims to have borrowed elements of Catan. I see hex pieces and wood for resources, and that’s about it. Shame on this game for false advertising (at least on the Kickstarter page). I found many typos on the cards and in the rulebook. Check out the name of the blue quest below. There’s nothing worse than short-circuiting a joke by flopping on the delivery. I’m being slightly facetious with those first two. However, I feel strongly about this next criticism, which is probably my main one for the game: for a game whose selling point is playing an Evil Overlord, I sure didn’t feel like one. I think the game’s theme integration falls far short of the mark. The Evil Overlord gimmick allows the game to convey its humor via cards, which is fine. However, the theme could also have been baked into the possible actions. For example, I wish the game had found a way to evoke constructing some absurd, world-molesting contraption, rather than just talk about it. At the very least, I would have liked some tools to mess with the Hero. You get to move him into spiked pits, but that’s about it. More of that, please! Messing with Heroes is the whole reason for being a villain! Most non-Bond fans don’t know the names of most Bond villains, they just know them as dudes who strap Bond to tables with slowly moving lasers floating around. Or check out the Emperor Joker storyline in a Superman comic from 2007 – Joker managed to acquire near God-like powers which he used to torture Batman and all of his nemeses over and over again. Joker defined himself as an antagonist to a good guy (which ended up being the key to defeating him). Anyway, my point is that Overlords doesn’t do much of this. Instead, the game wants us to buy into the idea that a lackey “exploiting” a resource tile represents cruel villainy. I just didn’t buy it. Am I harping on theme too much? Perhaps. However, the theme is the main selling point of the game. Without the theme, I think Overlords would fall further into the shuffle of similar games. I don’t have a lot of criticisms of the game from a mechanical perspective. However, I found the world events that (possibly) ended the game early very, very frustrating. 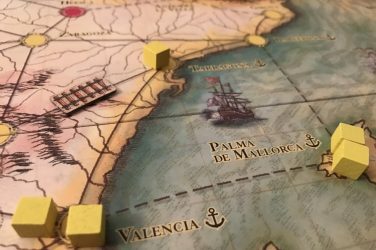 Those mechanisms are only good in games that you play a lot, whether because they are inherently short or because you love them that much that they hit the table all of the time. I see Overlords as a solid game that any fan of worker placement would be happy to have in their collection, but not as a game that I will consistently pull out. 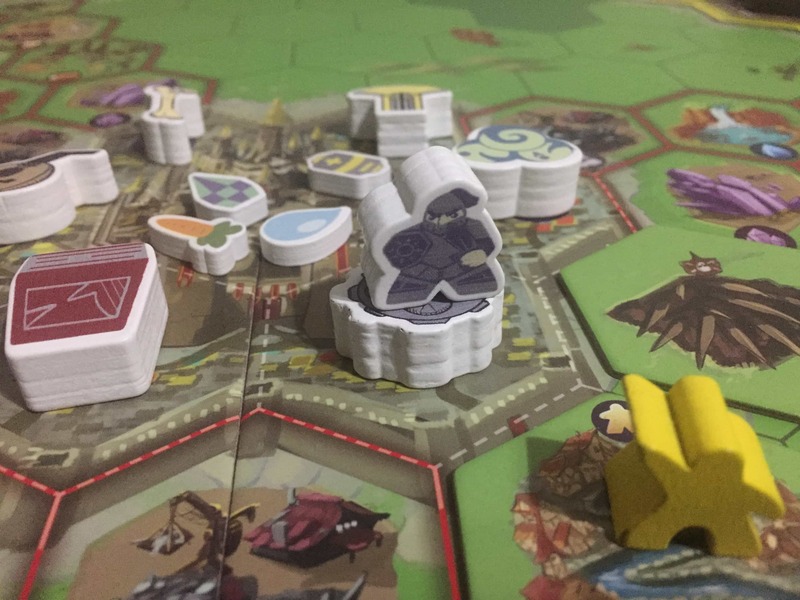 Overlords operates in the same gamer headspace (light-middle weight worker placement/ movement) as Takenoko, The Pursuit of Happiness, Champions of Midgard, Viticulture, and many others. That’s stiff competition. If I did introduce it into rotation and got THIS card, then I’d be pretty mad. Who is Overlords of Infamy For? 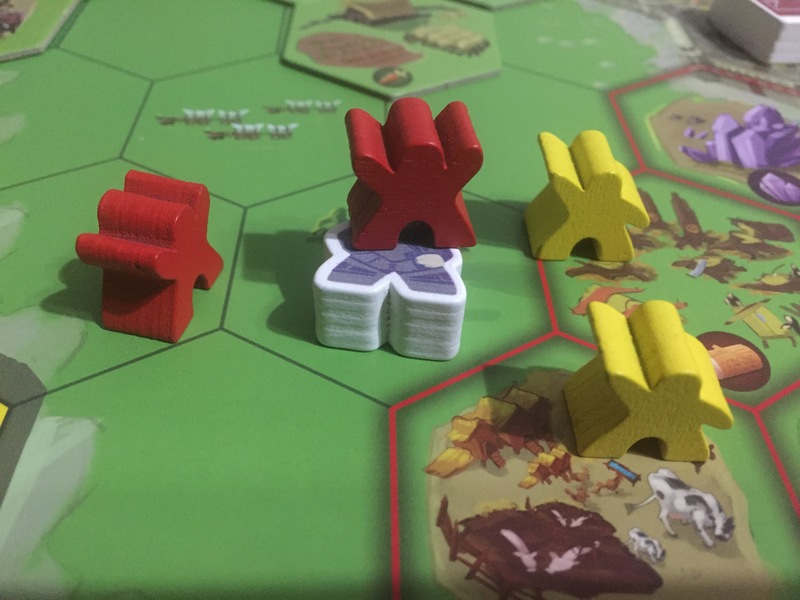 If you like worker placement games, Overlords takes some tried and true ideas and gives them a fresh coat of paint. I especially thought the player powers were well integrated, fun, and useful. 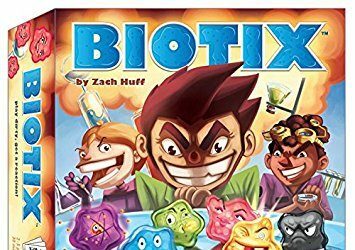 I don’t know that it surpasses other games in this space, but it has enough unique elements to it to be worth a look. Also, if somewhat corny, Despicable Me-esque humor makes you smile, then you’ll get a kick out of this game. A solid light-middle weight worker placement game with an endearing sense of humor.